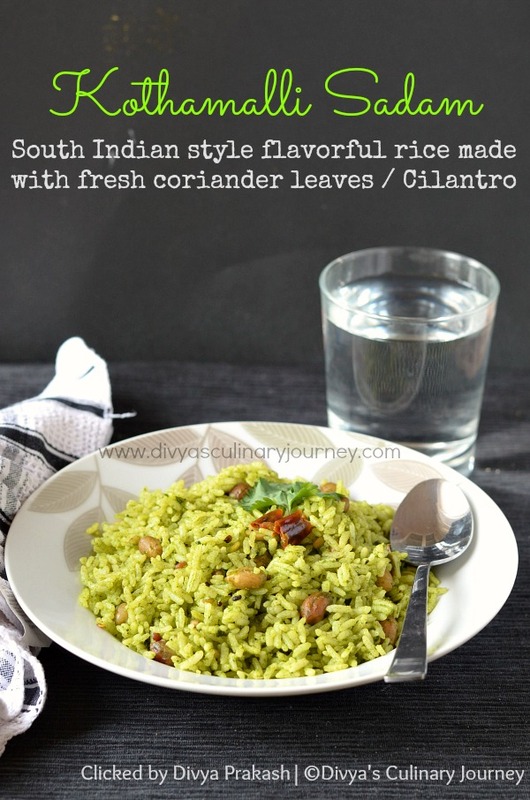 This is a South Indian style flavorful rice made with fresh cilantro leaves. It is quick to make and is Vegan. Yield : About 2 Servings. Green Chillies : 2 nos. Ginger : 1" long piece. Dried Red Chillies :1 or 2 nos. Grind together cilantro, green chillies and ginger, by adding 1/4 cup of water into a fine paste. 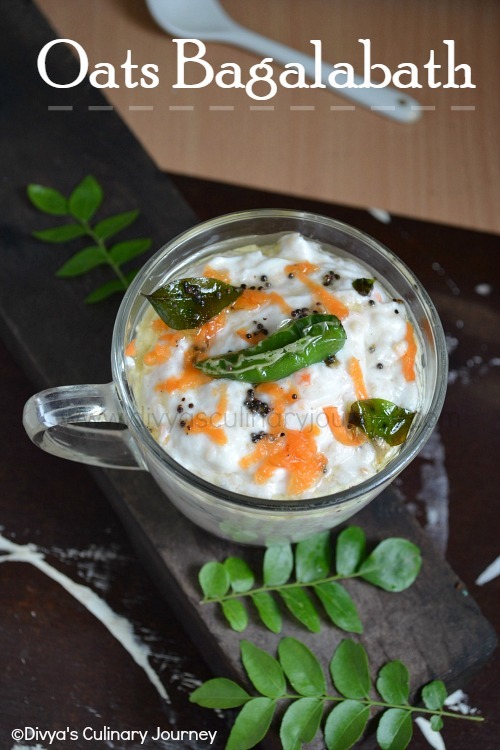 Heat oil in a pan and add mustard seeds, when they sputter, add urad dal, peanuts, red chillies and fry for a minute. Then add the ground cilantro paste, turmeric powder and salt, mix well and cook for about 2-3 minutes. Reduce the heat to low, add the cooked rice, mix well such that the cilantro mixture is evenly coated in the rice. Check and add salt if necessary. Cook for couple of minutes and then turn off the heat. Adjust green chillies and red chillies as per personal heat tolerance level. If you do not prefer adding peanuts, then you can replace it with cashews. I have not used onion or garlic in this recipe, but if you prefer you can add them for more flavour. This must be really flavorful! I love the ease of this recipe, but I'd use Basil instead of the cilantro. Yes, I'm one of those people where cilantro tastes like soap. Can't help it. It's truly in my DNA. I love this recipe. I can just imagine how wonderful the flavor is. I love rice but I never tried with cilantro. I am really curious now, looks delicious! I am a HUGE cilantro fan! Making this! We always make Cilantro rice when respected members of the family are coming over. The cilantro rice is considered to be a meal fit for kings! I love using cashews and raisins in this recipe, but, I am going to try your variation. I have to try this rice because it has all my favorite flavors in it. Lovely recipe. This would be so full of flavor, I adore cilantro!! 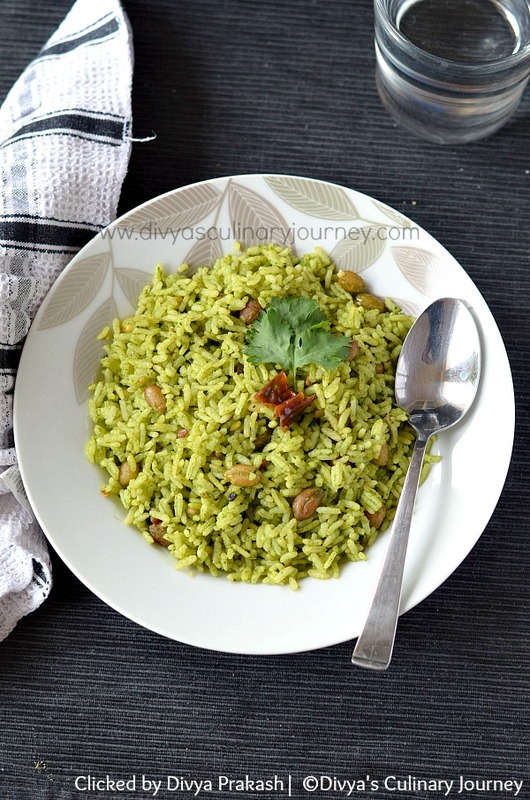 That vibrant color makes this rice dish so inviting and love the flavors, too! I am loving all the flavours in this, as I just adore coriander. This looks wonderful! I'm a big fan of cilantro, so this totally could be on my table soon! Thanks for the recipe. First of all I love the color! It looks so delicious and inviting! What a beautiful rice dish. I love cilantro and need to give this a try!